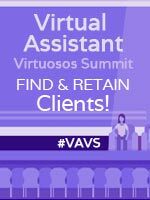 A well attended online event every Spring and Fall for Virtual Assistants is the VA Virtuosos Seminar #VAVS Series. It’s a quick and easy sell as every VA loves to attend this. 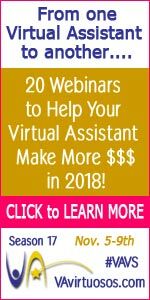 It’s an online seminar series held over the course of week with speakers who are Virtual Assistants themselves. Who better for VAs to learn from than their own business colleagues who have been there and done it already successfully? So what are you waiting for… earn some cash by promoting the VAvirtuosos Seminar Series! Price: Varies between $37-$297 depending on level ordered. That’s up to $74.25 USD for you! VIEW PRODUCT SALES PAGE Use any copy you like from our sales page to promote same. Here are just a sampling of the banner ads you can use on your website and hyperlink with your affiliate link. Just right click on image to save to your hard drive. Head to your promotion center for more.